The REACCH technology architecture focuses on harvesting, meta-tagging, and then integrating data through the use of geographically based web service protocols. Issue: Large multidisciplinary projects generate diverse data to help understand patterns and answer diverse questions. Managing, archiving, and making these data and associated tools easily available as an important legacy of the research is challenging. Action taken: We established a data management team and hired a dedicated data manager. The team developed a detailed data management plan and policy to help specify data types and timelines for making data available and accessible. The team also developed a transition plan to move REACCH data into a permanent repository to ensure continued availability beyond the funded project. The data team and Linda Urban conducted interviews and developed subsequent adoption strategies to help project scientists adjust to the new paradigm of open data sharing. Results: The outputs include a detailed data policy, planning documents, defined flow processes, and tools to help input data into an open-source accessible data repository. Over time we modified and adapted our processes using both automated and manual methods to help researchers input data. All data from the REACCH repository have now been transitioned and mirrored to the Northwest Knowledge Network at the University of Idaho and are openly accessible to anyone through download or by dynamic web service access. This hybridized approach for data retrieval is a model that is used by other state and federal organizations, such as NOAA, NASA, and the USDA. A REACCH website is maintained (https://www.reacchpna.org/) with a link to data and tool output products. Gessler, P. E., D. E. Seamon, and E. Flathers. Development of an open data management architecture and system to facilitate interdisciplinary research for building resilience to climate change in cereal production systems. Frontiers in Ecology and Evolution. In preparation. 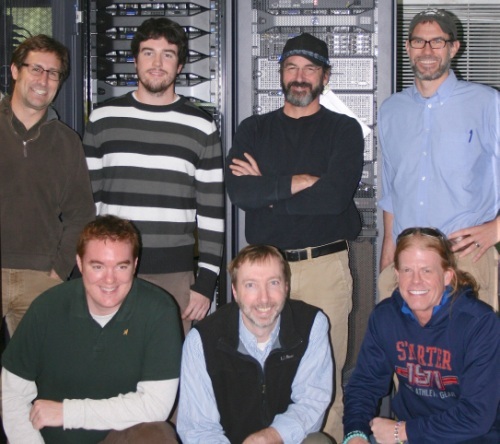 Members of the REACCH cyberinfrastructure team and Northwest Knowledge Network (NKN) personnel in front of enterprise servers. Issue: It is difficult to access data from federally funded research projects such as REACCH and share the data with the broader national and global research community. A national effort must be made to help resolve this and enable reuse of data from funded research. 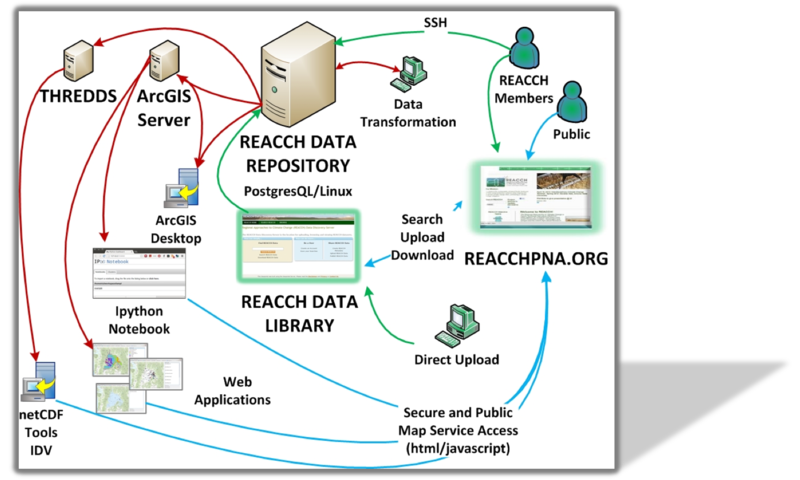 Action taken: We worked with the U.S. Department of Agriculture’s (USDA) National Agricultural Library AgData Commons project to implement a pilot project using REACCH data. Our teams defined data standards and types that allow REACCH data to be automatically represented on AgData Commons. Results: We agreed upon and implemented dynamic web services to expose REACCH metadata. These web services provide automatic access through the AgData Commons national repository, making REACCH data widely accessible to researchers. The Northwest Knowledge Network at the University of Idaho is now able to repeat this process for any USDA-funded research.